Woody was born 13 May 1923 in Lawton, Oklahoma to Howard Rochelle Ethridge and Alice Ima Johnston. When he was about 4 years old, his family moved to Tipton and he went to school there. 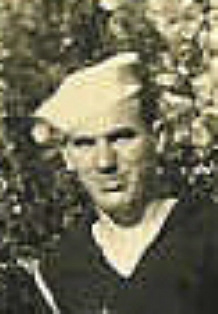 He joined the U.S. Navy after World War II started and served on the U.S.S. Essex and went through many major battles in the Pacific Ocean. He lived and worked in California after the war, and married Charlene McElroy. They had one son Michael Howard Ethridge. Woody died in Cypress, California in March 1991. Write up submitted by Barbara Cunningham and was not a part of the original 1940's publication.